Prime Time Boxing was first talked about in Shape magazine and Fitness magazine back in 1998 and 1999 about the difference between Tae Bo and the Prime Time Boxing workout. Since then, they have been written about and featured in national media and press including, Entrepreneur, USA Today, New York Times, Men’s Fitness, FHM, Muscle & Fitness HERS, Oxygen, and many television and radio segments. As they say, “Image is everything” and Prime Time Boxing already has one hell of an image! PRIME TIME BOXING, INC. was founded in 1998. A couple years later the Prime Time Youth Activities Center, a non-profit organization, was created to offer scholarship programs to pay for the training, equipment and travel expense of disadvantaged children. Their boxing programs have been featured on NBC, CBS, ABC and FOX as well as in national publications such as Shape, Energy, Fitness, Franchise Times, Entrepreneur, Inc., USA Today and The New York Times. They have trained and been in the corner of many boxers for national tournaments, such as the Golden Gloves, the Junior Olympics, the Silver Gloves, the National PAL, USA Nationals, Olympic Trials and many local shows. 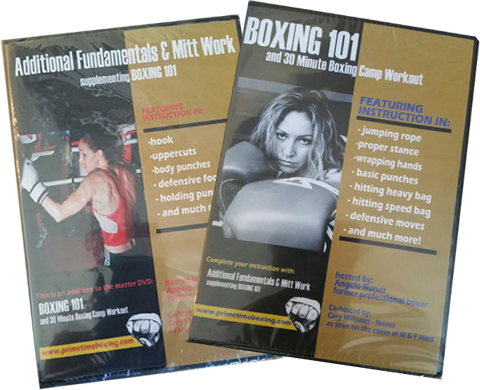 They created and hosted “Boxing 101” and “Additional Fundamentals”, unique boxing instructional and workout DVDs. Founder, Cary Williams was a spokespeople and advisor for Everlast Worldwide and conducted demonstrations at trade shows such as Magic and the SGMA in Las Vegas as well as assisting with new equipment design. With Everlast, she also created a boxing class format for 24 Hour group fitness called Everlast Shadowbox. This class launched across the nation in spring 2008. It'd be a sin not to get this home study combo! Learn the fundamentals of boxing. Click the link below to get the best of both training DVD's. Top notch, structured boxing training and a great workout!